Hi friends. We are now done with the basics of options. 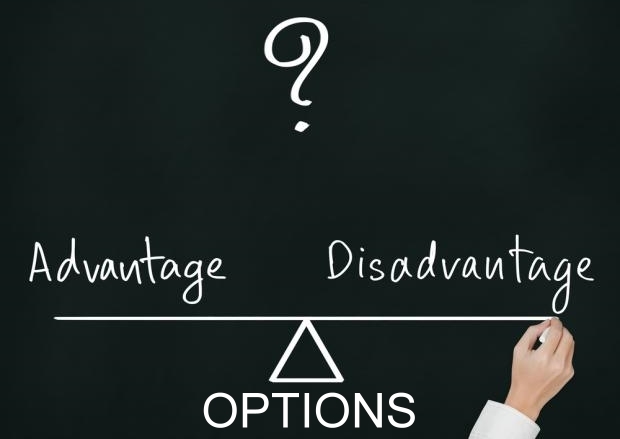 We were to start with the strategies today, but we received several requests from many of you asking why should we trade in Option and what can be the major advantages and disadvantages of trading in the options. Well this is a very relevant question as we should know the depth of the water before jumping in the swimming pool. So before we start the strategies, today we will take up major advantages and disadvantages of trading in options. Low capital needed: Capital required to trade is exceptionally low in case of Options. When compared to Cash and Futures, you can trade for a lot more in Options with the same amount of money. Limited Risk: When you buy an Option, you can create strategies, wherein you have limited loss, but unlimited profit. This why you have complete control over your position even before you have created one. Leverage: Unlike in futures or cash market, you just need to pay a small premium on the option that you purchase. This way you can trade for higher values with limited money. Unique strategies: Options allow you to create unique strategies which can help you to take advantage of different types of market conditions like high market volatility and time decay. Hedging instrument: Options are a very good hedging instrument wherein you can also completely hedge long-term stock positions at a low cost. Options work as an excellent tool for protecting your stock portfolio. High Brokerage charges: Traditionally brokerage on options is charged on a per lot basis, which becomes really high and makes it difficult for the traders to generate profits. Though this situation actually becomes your advantage when you trade with Moneypalm as Moneypalm Discount Brokerage charges only Rs. 15 per executed order in options, irrespective of your trade size, thus making the brokerage cost negligible. Difficult to understand: Options are very complicated and difficult to understand for the beginners. People generally tend to avoid trading in options as they do not have proper knowledge of how to trade in Options. If you also find it difficult to trade in Options, keep following our blog TradeTalk which teaches you how to be a smart trader. We hope that you have now understood the advantages of trading in Options and also the disadvantages associated with them. Though the disadvantages can be turned into the advantages, if we have proper knowledge of options. We always stress on learning the trade strategies, as nobody can earn money for you other than yourself. Of course, as your All Weathered Friend, Moneypalm is always here to help you learn the art and science of trading in the stock market as we have firm belief in our policy of “Together We Grow”. So friends, keep learning, keep earning and keep growing. We are always here to support you.